When President Bush visited Ground Zero on September 14, 2001, he addressed some of our 911 heroes. Hope and courage was in the air as President Bush spoke. Strength, resilience, and courage could be seen on the faces of all of our heroes. 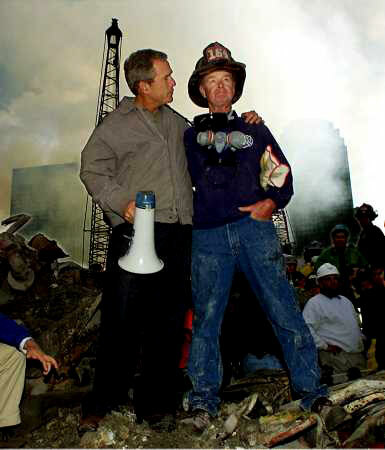 President Bush grabbed a megaphone and talked to our heroes, and while he was doing so, he was standing next to hero firefighter Bob Beck with his arm around him. This is one of the most enduring photos of 911. And the symbolism of the hug extended to all Americans – we are together on this…we are UNITED. God bless all of our 911 heroes. We love you all. And we will never forget what you did.